Well there you go, we’ve gone and said it now, the ‘C’ word. We have been trying to contain our excitement in the office lately at Christmas, but have been failing miserably. I am afraid that the Bing Christmas CD was well and truly ‘ON’ since 1st November. So being 24th November we think it’s pretty impressive we have shied away from promotions so far. But with only a few weeks left till the big day, we are starting things with not promoting ourselves (although our loungewear and nightwear make EXCELLENT presents!) but instead taking a look at some of the most exciting advent calendars out there in the countdown to Christmas. As a luxury loungewear, nightwear and accessory company we must of course start with the most luxurious of advent calendars. After all it is the best time of year to pamper oneself. 1. In at number one has got to be this delight from Jo Malone. What could be better than 24 individual little boxes of joy from Jo Malone. There is a selection of colognes and body cremes to layer up or down your Christmas scent. Mmmmmm delightful! £260 from Jo Malone London. 2. In at two we have this beautiful creation from Liberty of London. They have chosen 24 of their favourite beauty products so you can try out new or tried and tested remedies on each day of December before Christmas. Collated together in this distinctive Liberty print box, what could be better (or prettier!). £175 from Liberty London. 3. OK so technically there are only 12 little luxuries in this beautiful book, but then perhaps think of it as the 12 days of Christmas. This ‘Book of Makeup Magic’ from Charlotte Tilbury is just divine. This book contains 12 of Charlotte’s best kept beauty secrets to indulge yourself with over the Christmas party season. So go on treat yourself. £150 from Charlotte Tilbury. Perhaps our luxury offerings will take away all of your money to buy Betty Blue’s items, and we wouldn’t want to do that! So for some treats that are a little more within modest budgets here are our top three mid range calendars. 1. The body shop know you love your skin, so pamper it every day this December with 24 miniature pots of joy. At just £60 we think this is a bargain that you won’t be able to resist! Get it from The Body Shop. 2. Well yes sir-ee we will take on each here at Blue’s HQ! At just £39 this bargain won’t hang around long. Again a lovely little prezzie on each day before Christmas in December from the ranges at L’Occitane. Think French lavender, lemon verbena and scrummy almonds. It will be hard to choose which is your favourite! £39 from L’Occitane. 3. Christmas wouldn’t be Christmas with out a little bit of sparkle, and this calendar has plenty of mini bottle of sparkly polishes to keep your nails coordinating with your party dresses. You could even wear a different colour every day of December! £49 from Ciate at Selfridges. 1. This little beauty was a big hit last year and is back again with (jingle) bells on. 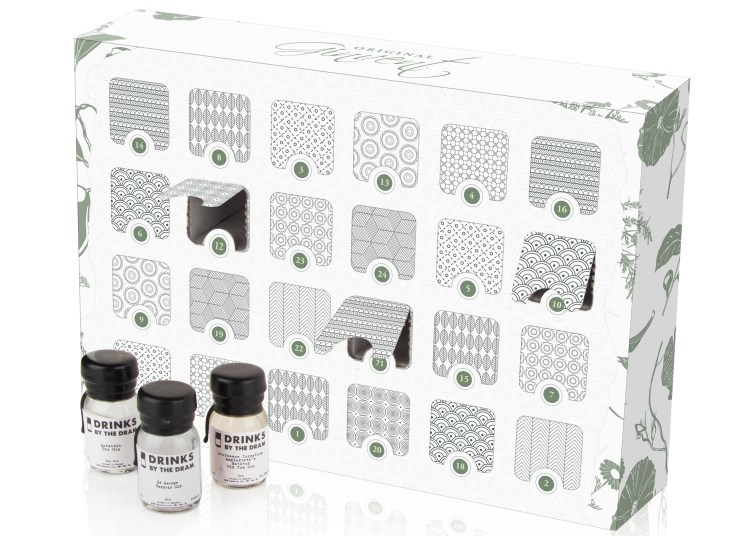 There are two to choose from, The Ginvent and The Botanical. So something for every Gin connoisseur out there…………..or just for any Gin lover. Behind each door is a tiny 3cl sampler of Gin to enjoy, perhaps have a tot by the log burning fire with a fresh sparkling tonic every evening. Gin not your thang? Well they have one for Whisky, Bourbon, Brandy, Rum or Tequila connoisseurs too. £114.99 from Masters of Malt. 2. The Belgians certainly know how to make good chocolates, and Godiva have been doing it since 1926, so here is a rather delicious little treat for you all to enjoy. Let them melt in your mouth slowly every morning for a little luxury that won’t cost the earth. Perfection! £23 from Godiva Chocolates. 3. Lastly we have a delicious biscuitty offering. If you have been watching our social media outlets you will have noticed we have already cracked out our favourite German Christmas treats already. Thank you to Germany for giving us the Mercedes Benz, Marlene Dietrich and Lebkuchen! The Leupoldt family have been making these traditional German gingerbread since 1905. This special little offering you can exclusively buy in store from Harrods, so hurry along to their Knightsbridge store. I hope you enjoyed our picks. Which will you be getting this festive season? Can we have one of each?